"3 words, 2 hearts, one kiss"
A pair of sterling silver heart rings on a leather cord. guard). Don't feel that you have to wait until next valentines day to buy it, though. The title is that of a song by one Billy Gilman, apparently. Not one that I knew; it was the quote caught my eye and Ionly found the origin later. 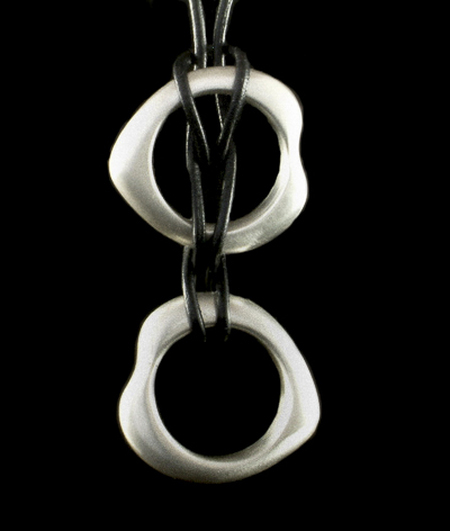 Is it a pendant or a pair of matching brushed silver rings? Well, the choice is yours: wear them as presented here; rearrange them as you like; wear both as rings; or wear one of each. The fine 1mm leather cord is simply looped round the ring bands and back onto itself, so is easily undone. It is finished with a silver carabiner clasp. If you like to fiddle with your pendants, you'll love these rings - their soft curves feel very sensuous in your fingers, but solid and reassuring at the same time. They're pretty chunky: each ring is around 7g despite being a smallish ring size (L). is a copy made using a process called delft casting.